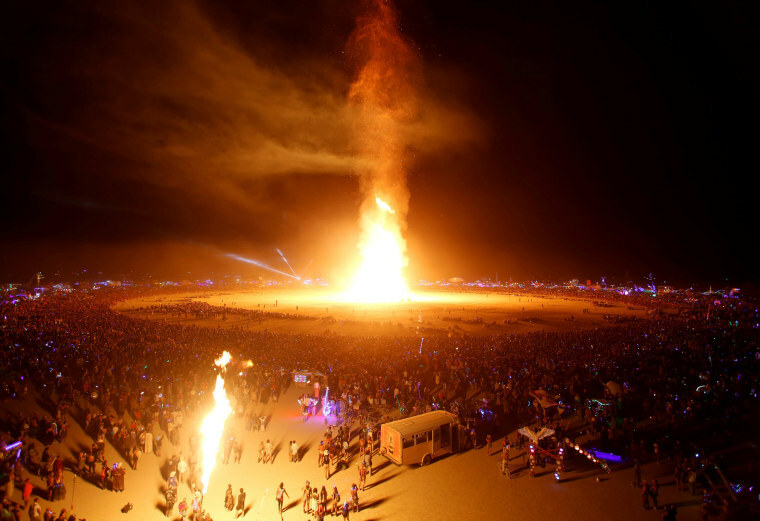 A 41-year-old man died Sunday after leaping into a massive fire at Burning Man, the annual arts event in Nevada's Black Rock desert that draws 70,000 people from around the world. Authorities and event organizers said Aaron Joel Mitchell died after breaking through a security barrier around the main "Man burn" event, in which a 40-foot-tall wooden statue is set alight. In a statement, Burning Man said Mitchell was pulled from the flames by firefighters and airlifted to University of California-Davis' burn treatment center. The statement said other planned burns had been canceled, although another ritual of the nine-day, 31-year-old event, the burning of a temple, was still scheduled for Sunday night.